To celebrate Let’s Click Photo Booths being selected as a Weddingwire Couples’ Choice Award Winner for 2015 the first 25 couples who book their 2015 wedding will receive our 2014 prices. We’re excited to announce that Let’s Click Photo Booths has been selected as a Weddingwire Couples’ Choice Award Winner for 2015. This prestigious award is determined by reviews from clients and recognizes Let’s Click Photo Booths as being among the top 5% of wedding professionals nationwide. This award reflects our commitment to excellence in quality, service, responsiveness and professionalism. We strive to provide couples with the best photo booth experience possible at prices that are in reach of everyone. Check out the award notification email snippet we received below! 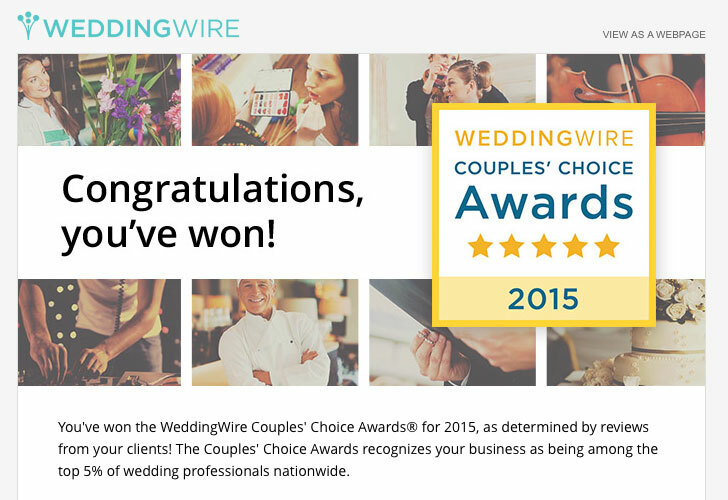 If you are one of the couples that wrote a review for us on WeddingWire – Thank you!